The remedy for too much luggage, too little space! 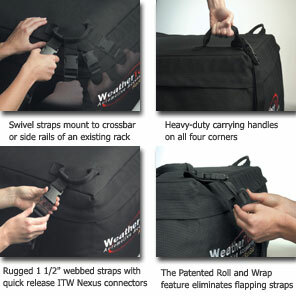 The WeatherTech RackSack expands your cargo carrying capacity a whopping 13 cubic feet (measures 39" x 32" x 18"). Made of durable water repellent polyester, the RackSack stows away neatly in its own bag. Features include swivel straps that mount to the crossbar or side rails of an existing roof rack, patented Roll and Wrap tabs to prevent flapping straps, and a soft felt bottom to protect your vehicle's finish from scratching.